In finance, a bond is a debt security, in which the authorized issuer owes the holders a debt and, depending on the terms of the bond, is obliged to pay interest (the coupon) to use and/or to repay the principal at a later date, termed maturity. A bond is a formal contract to repay borrowed money with interest at fixed intervals. Thus a bond is like a loan: the issuer is the borrower (debtor), the holder is the lender (creditor), and the coupon is the interest. Bonds provide the borrower with external funds to finance long-term investments, or, in the case of government bonds, to finance current expenditure. Certificates of deposit (CDs) or commercial paper are considered to be money market instruments and not bonds. Bonds are issued by public authorities, credit institutions, companies and supranational institutions in the primary markets. The most common process of issuing bonds is through underwriting. In underwriting, one or more securities firms or banks, forming a syndicate, buy an entire issue of bonds from an issuer and re-sell them to investors. The security firm takes the risk of being unable to sell on the issue to end investors. Primary issuance is arranged by bookrunners who arrange the bond issue, have the direct contact with investors and act as advisors to the bond issuer in terms of timing and price of the bond issue. The bookrunners' willingness to underwrite must be discussed prior to opening books on a bond issue as there may be limited appetite to do so. In the case of government bonds, these are usually issued by auctions, called a public sale, where both members of the public and banks may bid for bond. Since the coupon is fixed, but the price is not, the percent return is a function both of the price paid as well as the coupon. However, because the cost of issuance for a publicly auctioned bond can be cost prohibitive for a smaller loan, it is also common for smaller bonds to avoid the underwriting and auction process through the use of a private placement bond. In the case of a private placement bond, the bond is held by the lender and does not enter the large bond market. coupon — the interest rate that the issuer pays to the bond holders. Usually this rate is fixed throughout the life of the bond. It can also vary with a money market index, such as LIBOR, or it can be even more exotic. 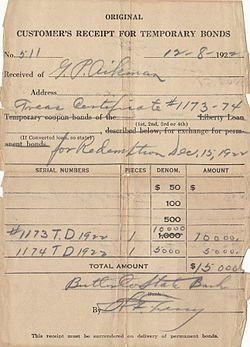 The name coupon originates from the fact that in the past, physical bonds were issued which had coupons attached to them. On coupon dates the bond holder would give the coupon to a bank in exchange for the interest payment. Callability — Some bonds give the issuer the right to repay the bond before the maturity date on the call dates; see call option. These bonds are referred to as callable bonds. Most callable bonds allow the issuer to repay the bond at par. With some bonds, the issuer has to pay a premium, the so called call premium. This is mainly the case for high-yield bonds. These have very strict covenants, restricting the issuer in its operations. To be free from these covenants, the issuer can repay the bonds early, but only at a high cost. The following descriptions are not mutually exclusive, and more than one of them may apply to a particular bond. Fixed rate bonds have a coupon that remains constant throughout the life of the bond. Floating rate notes (FRNs) have a variable coupon that is linked to a reference rate of interest, such as LIBOR or Euribor. For example the coupon may be defined as three month USD LIBOR + 0.20%. The coupon rate is recalculated periodically, typically every one or three months. Zero-coupon bonds pay no regular interest. They are issued at a substantial discount to par value, so that the interest is effectively rolled up to maturity (and usually taxed as such). The bondholder receives the full principal amount on the redemption date. An example of zero coupon bonds is Series E savings bonds issued by the U.S. government. Zero-coupon bonds may be created from fixed rate bonds by a financial institution separating ("stripping off") the coupons from the principal. In other words, the separated coupons and the final principal payment of the bond may be traded separately. See IO (Interest Only) and PO (Principal Only). Inflation linked bonds, in which the principal amount and the interest payments are indexed to inflation. The interest rate is normally lower than for fixed rate bonds with a comparable maturity (this position briefly reversed itself for short-term UK bonds in December 2008). However, as the principal amount grows, the payments increase with inflation. The United Kingdom was the first sovereign issuer to issue inflation linked Gilts in the 1980s. Treasury Inflation-Protected Securities (TIPS) and I-bonds are examples of inflation linked bonds issued by the U.S. government. Asset-backed securities are bonds whose interest and principal payments are backed by underlying cash flows from other assets. Examples of asset-backed securities are mortgage-backed securities (MBS's), collateralized mortgage obligations (CMOs) and collateralized debt obligations (CDOs). Perpetual bonds are also often called perpetuities or 'Perps'. They have no maturity date. The most famous of these are the UK Consols, which are also known as Treasury Annuities or Undated Treasuries. Some of these were issued back in 1888 and still trade today, although the amounts are now insignificant. 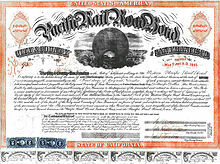 Some ultra-long-term bonds (sometimes a bond can last centuries: West Shore Railroad issued a bond which matures in 2361 (i.e. 24th century) are virtually perpetuities from a financial point of view, with the current value of principal near zero. Registered bond is a bond whose ownership (and any subsequent purchaser) is recorded by the issuer, or by a transfer agent. It is the alternative to a Bearer bond. 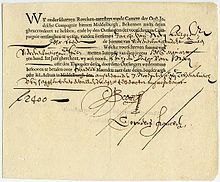 Interest payments, and the principal upon maturity, are sent to the registered owner. Treasury bond, also called government bond, is issued by the Federal government and is not exposed to default risk. It is characterized as the safest bond, with the lowest interest rate. A treasury bond is backed by the “full faith and credit” of the federal government. For that reason, this type of bond is often referred to as risk-free. Build America Bonds (BABs) is a new form of municipal bond authorized by the American Recovery and Reinvestment Act of 2009. Unlike traditional municipal bonds, which are usually tax exempt, interest received on BABs is subject to federal taxation. However, as with municipal bonds, the bond is tax-exempt within the state it is issued. Generally, BABs offer significantly higher yields (over 7 percent) than standard municipal bonds. Lottery bond is a bond issued by a state, usually a European state. Interest is paid like a traditional fixed rate bond, but the issuer will redeem randomly selected individual bonds within the issue according to a schedule. Some of these redemptions will be for a higher value than the face value of the bond. War bond is a bond issued by a country to fund a war. Revenue bond is a special type of municipal bond distinguished by its guarantee of repayment solely from revenues generated by a specified revenue-generating entity associated with the purpose of the bonds. Revenue bonds are typically "non-recourse," meaning that in the event of default, the bond holder has no recourse to other governmental assets or revenues. Climate bond is a bond issued by a government or corporate entity in order to raise finance for climate change mitigation or adaptation related projects or programs. Some companies, banks, governments, and other sovereign entities may decide to issue bonds in foreign currencies as it may appear to be more stable and predictable than their domestic currency. Issuing bonds denominated in foreign currencies also gives issuers the ability to access investment capital available in foreign markets. The proceeds from the issuance of these bonds can be used by companies to break into foreign markets, or can be converted into the issuing company's local currency to be used on existing operations through the use of foreign exchange swap hedges. Foreign issuer bonds can also be used to hedge foreign exchange rate risk. Some foreign issuer bonds are called by their nicknames, such as the "samurai bond." These can be issued by foreign issuers looking to diversify their investor base away from domestic markets. These bond issues are generally governed by the law of the market of issuance, e.g., a samurai bond, issued by an investor based in Europe, will be governed by Japanese law. Not all of the following bonds are restricted for purchase by investors in the market of issuance. Uridashi bond, a non-yen-demoninated bond sold to Japanese retail investors. Shibosai Bond is a private placement bond in Japanese market with distribution limited to institutions and banks. Dimsum bond, a Chinese renminbi-denominated bond issued by a Chinese entity in Hong Kong. Enables foreign investors forbidden from investing in Chinese corporate debt in mainland China to invest in and be exposed to Chinese currency in Hong Kong. The interest rate that the issuer of a bond must pay is influenced by a variety of factors, such as current market interest rates, the length of the term and the creditworthiness of the issuer. These factors are likely to change over time, so the market price of a bond will vary after it is issued. This price is expressed as a percentage of nominal value. Bonds are not necessarily issued at par (100% of face value, corresponding to a price of 100), but bond prices converge to par when they approach maturity (if the market expects the maturity payment to be made in full and on time) as this is the price the issuer will pay to redeem the bond. This is referred to as "Pull to Par". At other times, prices can be above par (bond is priced at greater than 100), which is called trading at a premium, or below par (bond is priced at less than 100), which is called trading at a discount. 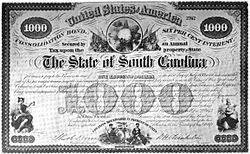 Most government bonds are denominated in units of $1000 in the United States, or in units of £100 in the United Kingdom. Hence, a deep discount US bond, selling at a price of 75.26, indicates a selling price of $752.60 per bond sold. (Often, in the US, bond prices are quoted in points and thirty-seconds of a point, rather than in decimal form.) Some short-term bonds, such as the U.S. Treasury Bill, are always issued at a discount, and pay par amount at maturity rather than paying coupons. This is called a discount bond. The market price of a bond is the present value of all expected future interest and principal payments of the bond discounted at the bond's redemption yield, or rate of return. That relationship defines the redemption yield on the bond, which represents the current market interest rate for bonds with similar characteristics. The yield and price of a bond are inversely related so that when market interest rates rise, bond prices fall and vice versa. Thus the redemption yield could be considered to be made up of two parts: the current yield (see below) and the expected capital gain or loss: roughly the current yield plus the capital gain (negative for loss) per year until redemption. The market price of a bond may include the accrued interest since the last coupon date. (Some bond markets include accrued interest in the trading price and others add it on explicitly after trading.) The price including accrued interest is known as the "full" or "dirty price". (See also Accrual bond.) The price excluding accrued interest is known as the "flat" or "clean price". The interest rate adjusted for (divided by) the current price of the bond is called the current yield (this is the nominal yield multiplied by the par value and divided by the price). There are other yield measures that exist such as the yield to first call, yield to worst, yield to first par call, yield to put, cash flow yield and yield to maturity. The relationship between yield and maturity for otherwise identical bonds is called a yield curve. A yield curve is essentially a measure of the term structure of bonds. Bonds markets, unlike stock or share markets, often do not have a centralized exchange or trading system. Rather, in most developed bond markets such as the U.S., Japan and western Europe, bonds trade in decentralized, dealer-based over-the-counter markets. In such a market, market liquidity is provided by dealers and other market participants committing risk capital to trading activity. In the bond market, when an investor buys or sells a bond, the counterparty to the trade is almost always a bank or securities firm acting as a dealer. In some cases, when a dealer buys a bond from an investor, the dealer carries the bond "in inventory." The dealer's position is then subject to risks of price fluctuation. In other cases, the dealer immediately resells the bond to another investor. Bonds are bought and traded mostly by institutions like central banks, sovereign wealth funds, pension funds, insurance companies and banks. Most individuals who want to own bonds do so through bond funds. Still, in the U.S., nearly 10% of all bonds outstanding are held directly by households. Fixed rate bonds are subject to interest rate risk, meaning that their market prices will decrease in value when the generally prevailing interest rates rise. Since the payments are fixed, a decrease in the market price of the bond means an increase in its yield. When the market interest rate rises, the market price of bonds will fall, reflecting investors' ability to get a higher interest rate on their money elsewhere — perhaps by purchasing a newly issued bond that already features the newly higher interest rate. Note that this drop in the bond's market price does not affect the interest payments to the bondholder at all, so long-term investors who want a specific amount at the maturity date do not need to worry about price swings in their bonds and do not suffer from interest rate risk. Bonds are also subject to various other risks such as call and prepayment risk, credit risk, reinvestment risk, liquidity risk, event risk, exchange rate risk, volatility risk, inflation risk, sovereign risk and yield curve risk. Price changes in a bond will also immediately affect mutual funds that hold these bonds. If the value of the bonds held in a trading portfolio has fallen over the day, the value of the portfolio will also have fallen. This can be damaging for professional investors such as banks, insurance companies, pension funds and asset managers (irrespective of whether the value is immediately "marked to market" or not). If there is any chance a holder of individual bonds may need to sell his bonds and "cash out", interest rate risk could become a real problem (conversely, bonds' market prices would increase if the prevailing interest rate were to drop, as it did from 2001 through 2003). One way to quantify the interest rate risk on a bond is in terms of its duration. Efforts to control this risk are called immunization or hedging. Bond prices can become volatile depending on the credit rating of the issuer – for instance if the credit rating agencies like Standard & Poor's and Moody's upgrade or downgrade the credit rating of the issuer. A downgrade will cause the market price of the bond to fall. As with interest rate risk, this risk does not affect the bond's interest payments (provided the issuer does not actually default), but puts at risk the market price, which affects mutual funds holding these bonds, and holders of individual bonds who may have to sell them. Some bonds are callable, meaning that even though the company has agreed to make payments plus interest towards the debt for a certain period of time, the company can choose to pay off the bond early. This creates reinvestment risk, meaning the investor is forced to find a new place for his money, and the investor might not be able to find as good a deal, especially because this usually happens when interest rates are falling. A number of bond indices exist for the purposes of managing portfolios and measuring performance, similar to the S&P 500 or Russell Indexes for stocks. The most common American benchmarks are the (ex) Lehman Aggregate, Citigroup BIG and Merrill Lynch Domestic Master. Most indices are parts of families of broader indices that can be used to measure global bond portfolios, or may be further subdivided by maturity and/or sector for managing specialized portfolios. ^ O'Sullivan, Arthur; Sheffrin, Steven M. (2003). Economics: Principles in action. Upper Saddle River, New Jersey 07458: Pearson Prentice Hall. pp. 197, 507. ISBN 0-13-063085-3. http://www.pearsonschool.com/index.cfm?locator=PSZ3R9&PMDbSiteId=2781&PMDbSolutionId=6724&PMDbCategoryId=&PMDbProgramId=12881&level=4. ^ Benjamin Shepherd. "A Slice of the Pie". InvestingDaily.com. http://www.investingdaily.com/ruk/18220/a-slice-of-the-pie.html. Retrieved 2010-1-19. ^ "Eurodollar deposit". http://www.riskglossary.com/link/eurodollar_deposit.htm. Retrieved 2009-01-05. ^ no byline (2005-12-05). "Ninja loans may yet overtake samurais". The Standard. http://www.thestandard.hk/news_detail.asp?we_cat=10&art_id=7106&sid=5769214&con_type=1&d_str=20051205. Retrieved 2008-12-09. ^ Batten, Jonathan A.; Peter G. Szilagyi (2006-04-19). "Developing Foreign Bond Markets: The Arirang Bond Experience in Korea" (PDF). IIS Discussion Papers (138). http://www.tcd.ie/iiis/documents/discussion/pdfs/iiisdp138.pdf. Retrieved 2007-07-06. ^ Gwon, Yeong-seok (2006-05-24). "‘김치본드’ 내달 처음으로 선보인다 (Announcement: first 'Kimchi Bonds' next month)". The Hankyoreh. http://www.hani.co.kr/arti/economy/stock/126171.html. Retrieved 2007-07-06. ^ Chung, Amber (2007-04-19). "BNP Paribas mulls second bond issue on offshore market". Taipei Times. http://www.taipeitimes.com/News/biz/archives/2007/04/19/2003357355. Retrieved 2007-07-04. ^ Areddy, James T. (2005-10-11). "Chinese Markets Take New Step With Panda Bond". The Wall Street Journal. http://online.wsj.com/article/SB112893305062664267.html?mod=article-outset-box. Retrieved 2007-07-06. ^ Stein, Peter (2010-11-01). "‘'Dim Sum Bonds' on the Menu for Foreign Investors". The Wall Street Journal. http://online.wsj.com/article/SB10001424052702304354104575568180321350908.html. Retrieved 2010-11-01. This page was last modified on 1 May 2011 at 13:15.